October was the month of the 30ths. Three of them to be precise. We started the month with Kim’s 30th cocktail house party. Neil’s followed the next weekend with a D-themed old school bar crawl through Chelmsford. I went as Daisy Duke, which was easy to do, as (maybe shamefully?) I own all the relevant items! I also thought about a dancer (tutu and my old pointe shoes - not ideal for a whole night out), Dannii Minogue (cocktail dress, super-high quiff and red lippie - basically a normal outfit then. Hmph.) and Dita von Teese (uh, far too cold for that kind of outfit – but had it been warm… well…). Mr G went as Dennis the Menace - such a suitable character for him. He’s always such a menace anyway that this gave him free reign to be naughty all night. I gave up after a while. I was screeching his name like an owner screeches at a cheeky puppy they’re trying to stop widdling on the carpet. Then last weekend Katie W had a K-themed London quiz and tour. For that I spent about two weeks sewing together a Katy Perry outfit. 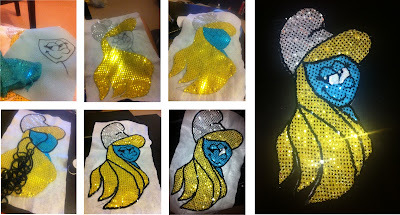 I didn’t go for the obvious choices of clouds, cream buns or cans of squirty scream (see my reasons above for Dita von Teese) coupled with wigs in primary colours, but instead decided to get creative and make a replica of the outfit she wore to the Smurfs movie premiere – on the blue carpet. I could TOTES be a movie star. Yah? I then added my own little spin with a little hair band consisting of a mushroom (the kind that Smurfs live in – obvs) and a mini Papa Smurf… well I wanted to be a little bit original! After a couple of false starts, I finally drew the outline on to some pieces of white, blue and yellow felt, cut out the shapes and then sewed silver, blue and gold sparkly material to each individual piece before sewing them all together on one main piece of felt. 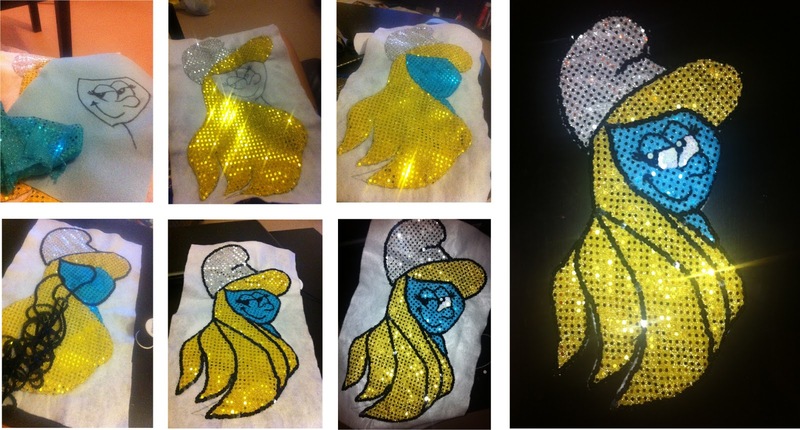 I then replicated the black outlines, cartoon style, with a strip of black sequins. I sewed her pretty features on her face with double thickness wool and a darning needle, and then filled in her eyes with white sequins. After that I cut her out and sewed her on to a corset top I’d purchased on eBay. I thought it’d be more of a dress, but when it arrived I realised it was more of a fetish outfit (anyone want the white, adjustable, polyester thong that came with the corset and skirt, which technically isn’t a skirt, when you actually look at it… yucky), and I’m now being bombarded with “you might also like...” emails from similar shops. Not cool! 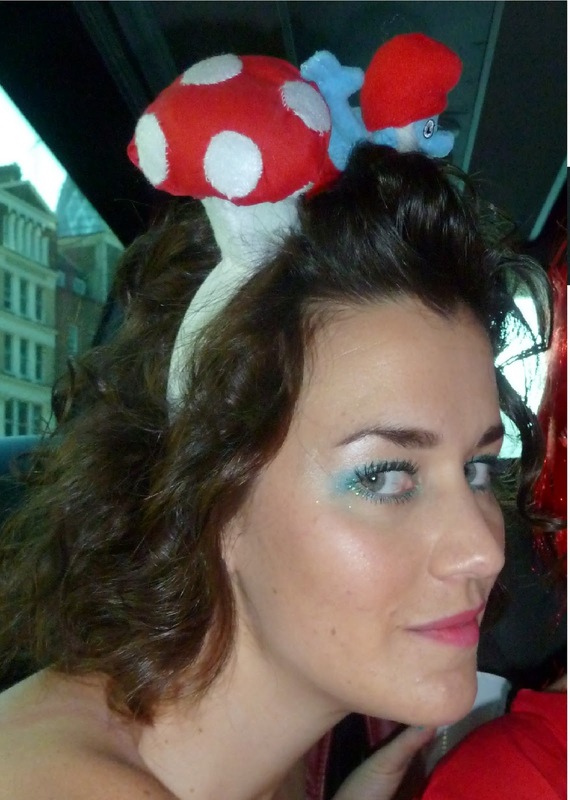 The hair band I purchased from HobbyCraft, and I made the mushroom by chopping up sponges, covering them with the scraps of left over felt and sewing them all together. Papa Smurf, as you may have guessed was a toy from a McDonalds Happy Meal. The shame of finding one of those in your flat, eh? I was pretty proud of me. I’m not normally famed for my domesticity! In fact, I'm not ever famed for my domesticity. The only problem with the outfit (well, aside from the fact that had I not worn shorts underneath I would have been arrested) was that shortly after the end of Katie’s event I had to dash across London in the early evening, dressed like a Tube Crazy (we’ve all seen them! ), to attend my cousin Jo’s 21st birthday. I’m not sure what my family, and Jo’s friends thought when I turned up, slightly tipsy, dressed like, well, dressed like god knows what, clutching some cake pops and a champagne fountain. But to be honest, they all know me well enough, or had been pre-briefed, so to be honest, had I turned up without any drama, they would wonder what was wrong! I promptly wiggled out of my KP outfit, managed to get my hair up, my drag queen-style make up off and put on a more appropriate, grown up party dress (teal, low V back with gold stud buttons, three quarter length sleeves and knee-length skirt from Zara. Tres gorge) only to ruin the effect with a giant sombrero after too many tequila slammers and margaritas. My next foray in to fancy dress is next week for a hen weekend in Bath. The theme is excellent – so wait and see what we all come up with. I love M&Ms, colour-pop shoes, polka dots, candy stripes, my family, tea and chats with my girls, all my buddies, cupcakes, vintage tea cups, two sugars in my tea, my mobile telephonic devices, The Queen, snuggly pyjamas, Helena Bonham-Carter, Sky+, my best friends' children, dancing, nail varnish, Alice in Wonderland, fuschia lippie, Lady Gaga, cuddles and snuggles, photos, Edward Monkton greetings cards, the original Pride and Prejudice, scented candles, Marilyn Monroe, cosmopolitans, party planning, Tatty Devine, holibobs, the Harry Potter series, diamonds, my hot pink Louboutins, city breaks, manicures, reading, decorating, zumba, history, Grazia magazine, Emma Thompson, twists in the tale, Friends, Thai green curry, Madonna, TOWIE, The Budgie, petticoats, Chanel, Just Dance II, vintage dresses, thin-based pizza, my gold sparkly Mulberry clutch, big hair, my eyelash curlers, Strawberry Shortcake, burlesque and champagne coupe glasses. So basically not materialistic at all then!